I’ll Take the Hamburger, Hold the Burger (a post by Lyz and Josh): Balsamic Portobello Mushrooms & Olive Tapenade Toasts – Eat Me. Drink Me. Request! Request! We have a Request for a “vegetarian section with yummy recipes that don’t require a 100 different ingredients.” I think we can do that. Maybe 99 ingredients, but who’s counting? Both of which are still true today, but I’ve relaxed a bit as to my meat restrictions. Basically, now I don’t cook meat for myself but I’ll have it if someone offers me a meal with meat (see: first day on a farm in New Zealand, and the owner tells me that we’re having lamb that he just killed yesterday). Partly I don’t cook meat for myself because I don’t enjoy it all that much, but mostly because I can’t cook it. See, I started cooking during my vegetarianism stint in roughly 11th grade. So, most of my repertoire is vegetarian based. Because of that, I used to focus mostly on side dishes, appetizers and some baked goods. I thought entrees consisting of only vegetables would be boring and not satisfying at all. But I had to branch out somehow – I would come home from waiting on tables at 11pm and have to cook myself something to eat. A bunch of side dishes only cut it for so long. So I would scrounge my fridge, throw some oil, garlic and salt in a pan and hop to. A few of these recipes stay as appetizers or side dishes, trying not to call too much attention to themselves, but some of them really started to shine. I used to call myself an adamant carnivore. Vegetarians were weirdly cult-like people who couldn’t recognize a good thing if it bit them in the face. I persisted in these beliefs for a long time, relishing meaty steaks, barbequed chicken, pork chops, you name it, and judging vegetarians because I assumed they judged me. It wasn’t until I started cooking for myself that I realized I actually liked cooking vegetables more than meat. They were so versatile and had more potential for experimentation than, say, a grilled piece of chicken. I thought about my diet, and noticed that even as a child, I consumed primarily vegetable rather than meat based dishes. Meat was something I ate in restaurants or when my dad was tasked with feeding us. I approached vegetarianism with an open mind and a new consciousness. Not only was it the way I ate anyway, but it came with a number of benefits as well, not least being its sustainability and healthfulness. I wish I could say I became indignant, threw down my glove, and called for a duel, but what really happened was that I thought about my proposition a little more, realized it would never happen, and got a hamburger for lunch. I may not be a vegetarian, but I highly support those who have committed to the cause (although I do not support “animals are cute” vegetarianism; I think asparagus is cute and I eat it anyway). While I’d jump all over a juicy steak if you handed it to me, I can’t remember the last time I ate meat, and I still feel fine. Josh: I broke my vegetarianism in college, because the last thing I wanted to do was to worry about food in addition to classes, friends, clubs, and other extracurricular activates. But I do remember a dinner with Lyz, in the last days of the Spring Semester where we had nothing to do but hang out, cook, and eat. Lyz: I have, in fact, had a number of very memorable vegetarian meals – the graveyard feast being one of them. But like the rest of my relationship to vegetarianism, I hadn’t realized that it was a totally vegetarian meal until Josh brought it up. Josh: It was a hodgepodge meal – no cohesion other than our favorite recipes. Lyz with her appetizer, some left over pasta, and me with my mushroom(s). Lyz: It was the end of the semester, the sun was shining, we were hungry, dare I say the planets had aligned? Kate, Josh, Ben, and I met in Kate’s kitchen to collect our ingredients and see what we could come up with. I had wanted to make one of my favorite recipes of all time – olive tapenade with goat cheese on garlic-rubbed baguette. That, plus the pasta we had on hand, settled the Italian theme, whose beauty is in the smell of garlic and olive oil that haunts you while you cook, pervades the tomatoes and bread you eat, and even scents your pores when it’s all over. Josh: I was still really into reducing balsamic vinegar and wanted to spread this news to my good friends, so I decided to take on sautéed, baked, reduced mushrooms. It sounds a lot more complicated that it really is. You’ll see. Anyway, we hopped to; Lyz began at one end of the kitchen by cutting the bread, mixing the olives and just getting plain messy with her ingredients. I think I remember her laughing her way to the floor with hands covered in goat cheese, some pepper, maybe even some honey and olive flakes. I was pouring over the stove, waiting for my vinegar to turn from that flavor to a sweeter, more agreeable taste with the mushroom caps absorbing the glaze as if they were sponges. In the background, music blasted, the doors were open, and Kate and Ben were dancing all over the apartment waiting for our well-timed meal to finish. Lyz: After realizing that the dishes had been packed away already, and all we had to eat with was what we’d cooked in, we grabbed our pots and baking sheets and trekked outside to find the perfect spot. We stumbled upon the graveyard – I hadn’t even known it was there, and in delicious irony, ate our vital meal among the dead. Josh: Oh, what a day for the vegetarians. Enjoy what we’ve made for you to make. Finely chop olives, tomatoes, basil, garlic, and capers together. 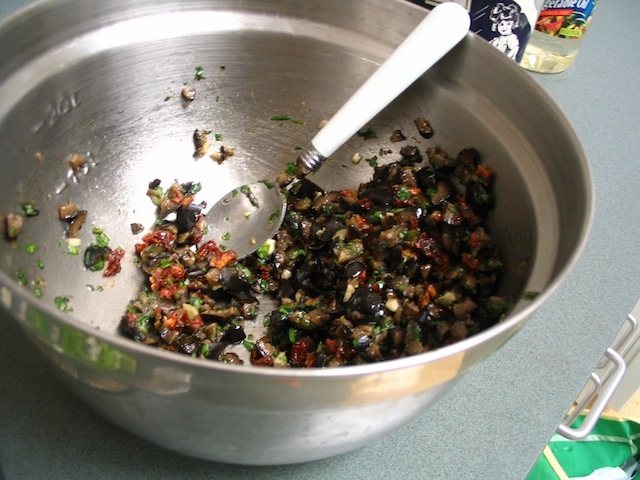 There’s no definite right blend, but the tapenade should be colorful, so don’t skimp on the tomatoes or basil. Cut baguette into ½-inch slices and toast lightly under the broiler until crisp. Cut open a garlic clove and rub it over the surface of each toast. 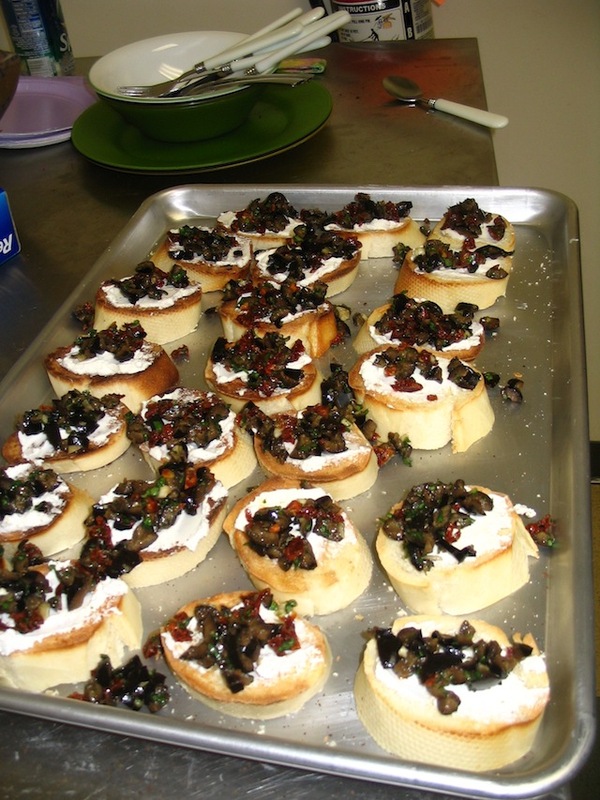 Spread goat cheese thickly over each toast and top with tapenade. Pre-heat oven to 350. Cover the bottom of a skillet with balsamic and place on a medium stove for 2-4 minutes just to get it warmed up. What we’re going for is a reduction, which is going to sweeten the vinegar. When the vinegar is nice and warm, add the mushroom tops. Depending on the size of your skillet, it might be two at a time, or one. There should be enough vinegar in the pan so the mushrooms don’t sit on a dry pan. Sauté the mushrooms for 5-7 minutes, adding salt, pepper, and vinegar to your liking, until almost done, then transfer to a baking sheet. Divide goat cheese, pine nuts, the rest of the syrupy balsamic, and the pressed garlic into the shroom’s caps. Bake that concoction for 5-7 minutes. Something without goat cheese? Always love the stories behind the food!